remaining faithful to God and his word through all of life’s ups and downs. discipling and mentoring others as we walk this path of faith together. praying and loving others, leaving the judging to God. keeping our eyes on God instead of all the ‘attractions’ of this world. sharing the Good News with others so they might believe. 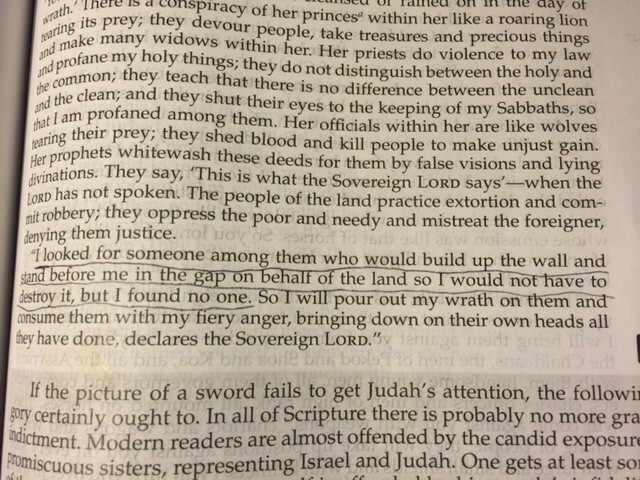 In Ezekiel, God told the people of Judah that he had looked for someone to stand before him in the gap on behalf of the people of the land but he found no one. Dear Father, you are a righteous and holy God. Please help us walk in step with you, repentant and obedient. When you look on us today, may you find us standing in the gap for others. You have made that possible by your grace and the power of the Holy Spirit who lives inside of us. We love you! In the redeeming name of Jesus we pray, Amen.